In the interest of reducing end-user confusion between two similar parts (TM-RED and TM-RACE), the color of the urethane in TM-RED has been changed to a blue color. The part name has also been changed to reflect this update. TM-RED is no longer available, all orders for this part will be filled with TM-BLUE. TM-BLUE is the same product as TM-RED but in the blue color. The change was made to eliminate confusion with the red-colored TM-RACE. TM-BLACK – fully isolated black rubber mounts, upgraded strength and stiffness over the OEM transmission mount bushing. This upgrade reduces drivetrain rotation relative to the chassis, improving shifting precision, reducing mis-shifts, and smoothing out power delivery. This part is an ideal service replacement part of performance part for street-drive cars including those that see occasional track days. No increase in cabin noise/vibration. [ CLICK HERE ] for pricing/ordering. TM-BLUE – fully isolated blue urethane mounts, even greater strength and stiffness over TM-BLACK with enhanced improvements. Ideal for performance-driven street cars and those with increased power levels (turbo/supercharger). Customer comments of increased cabin noise/vibration are rare but may occur. 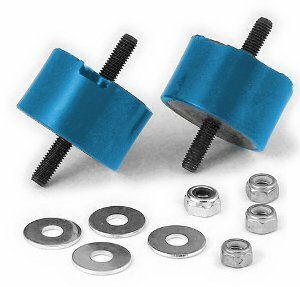 TM-RACE – bolt-through red urethane mounts that provide a direct mechanical connection by way of a high-strength bolt. This part is recommended for track/race cars or those with extreme power increases. Isolation from extreme vibration is still provided but some cabin noise/vibration should be expected due to the direct metal connection between drivetrain and floorpan. All varieties may use the UUC Transmission Mount Enforcers (part number TME) for added reduction in shear (side to side) movement of the drivetrain parts. Please contact UUC directly with any questions about this or any other UUC part.